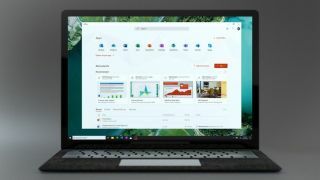 Microsoft has launched a new Office app for Windows 10 users that looks to make using the company's products even easier. Replacing the previous "My Office" app currently available, the new tool looks to provide a more useful way for Windows 10 users to quickly find and access Office documents, apps and services. The app is free to use, and will come preinstalled with Windows 10 going forward, but users won't need an Office 365 subscription to use it - it can be installed from the Microsoft Store if needed as well. The launch comes as part of Microsoft's efforts to promote the usage of its online version of Office, which includes free versions of popular programs including Word, Excel and PowerPoint, even if you're not a subscriber to Office 365. With that in mind, the new Office app presents a full list of all the services and apps available to the user, along with tutorials, tips and tricks, and other helpful information for Microsoft's office solutions. Microsoft says that IT administrators will also be able to customise the app, adding branding and enabling access to third parties, as well as utilising Microsoft Search to create internal search apps. "The Office app provides users with a simple experience that helps them get to what they need quickly – whether that’s an app, a document, or even a person in your organization," Microsoft's Bill Doll wrote in a blog post announcing the launch.